US Secretary of State, John Kerry, recently met with people from Syrian opposition groups – including the “first responders” – the White Helmets. Somebody recorded the discussion and it has now been leaked (see Audio Reveals What John Kerry Told Syrians Behind Closed Doors). The discussion is quite revealing, for a number of reasons, including divisions within the US ruling political circles and Syrian opposition beliefs that the US is not doing enough for their cause. But here I will just concentrate on aspects relevant to the anti-Syrian propaganda our news media seems to be saturated with. That is certainly happening at the moment. One could be excused for believing that the Syrian war is all about the government and their allies, the horrible “Russkies,” purposely attacking civilians, destroying civilian buildings and, particularly, burying young children in rubble. This image is typical of what we are exposed to – and news services like Al-Jazeera seem to present variants of this image almost every day. Typical media photo of White Helmet “first responders” rescuing children in a ‘rebel”/”terrorist” held area of Syria. Of course, if this was the true intention of Syria and its allies the war would be over by now. But in fact, the Syrians and their allies are fighting armed “rebels”/”terrorists,” very many of them from outside the country. Armed and financed by external powers directly or indirectly. Countries like Saudi Arabia, Turkey, Qatar, USA, UK and other NATO countries. Civilian casualties, including children. may, at times, be an accidental by-product of this sort of war (what the US calls “collateral damage”) and can be caused by either side. But it is disingenuous to portray this as the intention of Syria and their allies. On the other hand, let’s not forget that terrorists very often deliberately target civilians, including children. Aleppo has become the Middle Eastern Stalingrad. I sometimes wonder what sort of propaganda the German citizens at home were served with during the Stalingrad battle in World War II. Did they get images of children being pulled out of the rubble and hysterical complaints about those horrible Russians bombing and shelling the city indiscriminately – perhaps purposely bombing hospitals, schools and civilians? That sort of propaganda seem ludicrous to us now – but how different is it to what we are currently fed by most of our media? Images and videos like those produced by the White Helmets are very effective. News readers are inclined to weep and it is hard not to empathise. After all, these are children. And the “first responders” rescuing them, the White Helmets, must be angels. Hell, they have even been recommended for the Noble Peace Prize and who would deny them that? Well, I would – but more of that below. The Syrian opposition people referred Kerry to images videos like this as reasons for the US to become more involved – to impose a fly-free-zone in Syria. But the US officials present pointed out that these images and videos were of no use to them. If these opposition people have video cameras around to film such events they should be filming the attack itself. Providing evidence that it is specifically the Syrians or Russians who are attacking civilians. These officials believed such information would be more useful to their cause. The US officials also directed this critique at the White Helmet coverage of the attack on the humanitarian aid convoy in Aleppo province. A White Helmets’ spokesperson fronted images of burning trucks, claiming the attack was by Syrian helicopters, barrel bombs, and Russian bombers (he didn’t seem to want to miss anything out). But the officials’ response was that coverage was not useful – they need images of the attackers themselves. They need evidence of the munitions used. Incidentally, the White Helmet spokesperson in this report leads a double life – see below. As an aside, this plea for evidence, especially the munitions used, shows how hypocritical is the US claim it was the Russians who were responsible for the attack on the aid convoy. Unfortunately, such unfounded (or at least evidence-free) claims from John Kerry and other US spokespersons are not new to us. But also, unfortunately, this claim is being used specifically to justify breaking off diplomatic negotiations on Syria and to argue for “Plan B” – the military option of a fly-free-zone or outright attacks on Syrian armed forces. This brief video from The Friends of Syria in Australia provides some information and background on the White Helmets organisation. If nothing else, the fact that the group operates only in areas held by “rebels”/”terrorists” (despite claiming in its propaganda that it is neutral) is telling. The fact they receive funding from anti-Syrian governments including the US and the UK (despite claiming they don’t) is also telling. Their spokespeople also never seem to miss any chance to attribute all the damage and loss of life to “the regime,” barrel bombs and the Russians – often in hysterical tones. I referred above to the White Helmet coverage of the humanitarian aid convoy attack. The image on the right is taken from the White Helmet report video. That on the left shows that the same guy is also involved in an armed “rebel”/”terrorist” group. Armed “rebel”/”terrorist” in Aleppo dons white hat and becomes an unarmed member of “aid” group – the White Helmets – reporting the attack on the humanitarian convoy. Image Source Friends of Syria. Another charge sometimes laid against the White Helmets is that some of their videos are staged and involve actors. News media often reenact actions from wars (although they usually acknowledge their video is a reenactment). The report “White Helmet” “Save Aleppo” Protest Proves How Easy it is to Dress Up Actors as “War Victims” shows how easy it is to make such staged videos to promote as news. Actors staging a typical White Helmet “rescue” during anti-Syrian protests in Europe. Of course, that charge is also easy to make and hard to prove. But there has been at least one official complaint to the BBC about them running videos of staged scenes in their programmes about Syria. I find it suspicious that the White Helmets always seem to go into action with a sizable camera crew in attendance – or at least with mobile phones recording the events. And there seems to be a common elelementf a guy, wearing a white helmet and White Helmet logos or uniform, carrying a child and urgently rushing forward or away from the camera. I can’t help feeling such videos are contrived. Contrived or not the White Helmets’ videos are certainly emotively picked. They know what works. And our media goes along with the game – ignoring the children and civilians injured and killed by “rebel”/”terrorist” missiles in government-held areas. The above video shows the aftermath of a “rebel”/”terrorist” attack in west Aleppo. Not a single White Helmet in sight! The video and photographic propaganda promoted by the White Helmets is not “proof” of their claims – but it is very effective in promoting a narrative. A narrative which can be used to justify direct military attacks by the US and NATO on the Syrian forces and their allies. (Yes, the US and NATO already illegally bomb Syria and have armed forces on the ground – but so far these have not intentionally been directed at Syrian forces). We saw what this led to in Libya – it was disastrous. And considering the support Assad has in Syria this regime change, or attempted regime change, would be much worse. Russia is deploying advanced S-300 and S-400 Air Defense systems in Syria. An attempted Libyan-style “regime change” by the US and NATO would be disastrous. Humanitarian intervention – but when & how? People are demanding politicians do something about the current refugee crisis. They are demanding humanitarian intervention, a change in the normal rules and so that refugees can be settled safely. Politicians are dragging their feet – which is inhumane, considering the gravity of the situation. But I do have sympathy for the view, expressed by some politicians, that this sort of action does not solve the basic problem. I especially sympathise with those politicians who are starting to acknowledge that this crisis is a logical result of drastic mistakes they made in the past. 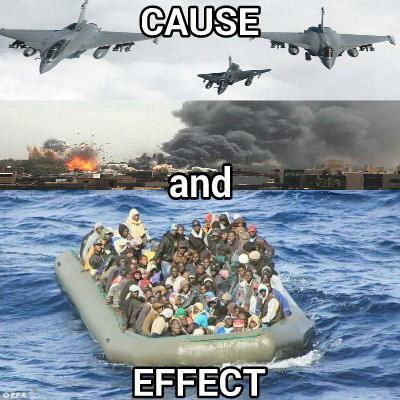 Refugees are justifiably fleeing from horrible situations in their own countries – situations actually caused, or made worse, by the actions of the USA and NATO. The invasion of Iraq, the bombing of Libya and the support for anti-government forces in Syria, created chaotic regimes and devastating wars – and hence the refugee crisis. The problem is that these invasions and bombings were, themselves, justified as humanitarian interventions. The George W. Bush government launched the invasion of Iraq with the admitted aim of regime change – the ousting of Saddam Hussein. Similarly, the USA and NAQTO justified their bombing of Libya by the aim of removing Gaddafi. And even now the USA refuses to take part in an anti-Islamic State coalition including Syria – because they wish to get rid of the elected Syrian leader Assad. The USA and NATO countries justify these aims by claiming they are humanitarian. They want to remove dictators who have repressed their people. They want to deliver democracy to the people in those countries. David N. Gibbs reveals the hypocrisy of such US and NATO “humanitarian intervention” in his book First Do No Harm: Humanitarian Intervention and the Destruction of Yugoslavia . His book is a detailed description of the history of intervention in Yugoslavia and its consequent break-up. But the lessons are wider. “Humanitarian” military intervention became a way of justifying NATO. After the collapse of the USSR and dissolution of the Warsaw military alliance, NATO was searching for a justification for its own existence – instead of logically following the Warsaw Pact example. The USA wanted NATO as an instrument of their new-found power as the sole remaining superpower. NATO became a way of asserting US power in their competition with the European Union which was starting to exert independence, and of providing a legitimacy to is intervention in foreign countries. NATO provided an umbrella when the UN Security Council wouldn’t. Ironically, this US leadership has disappeared when the chickens are coming home to roost. Europe now has to deal with a refugee crisis largely caused by US intervention in Middle Eastern countries. Effectively Europe is now having to bear the fruits of their lack of opposition to US intervention, and, in the case of several European countries, involvement as active parties in that intervention. People do have to intervene to demand that politicians deal humanely with the current refugee crisis. But let’s not forget its causes. We also have to demand that military intervention of the sort we have seen in recent years has to stop. The people of these targeted countries must be left to sort out their own political problems in their own culturally and historically appropriate and realistic ways.